Delhi’s rich cultural heritage dates back centuries. Home to nearly fifteen million people, this buzzing metropolis is still growing, drawing people from all corners of India and the globe. And yet, tucked away in the nooks and crannies of Delhi's modern suburbs and development lie tourist attractions such as ancient tombs, temples and ruins. The magnificent size of the metropolis alone is reason enough for adventurous travellers to explore. With a wide range of accommodations to choose from, backpackers and luxury travellers alike will find the beauty in Delhi. 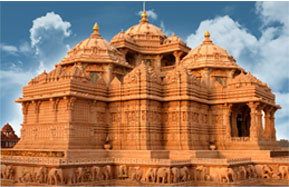 Also referred to as Delhi Akshardham or Swaminarayan Akshardham, the temple complex is the pinnacle of 10,000 years of traditional Hindu and Indian culture. Its breathtaking grandeur brilliantly showcases the essence of India's ancient traditions, architecture and timeless spirituality. The Akshardam temple is an enlightening journey through India's glorious art, values and contributions for the advancement, happiness and peace of all mankind. 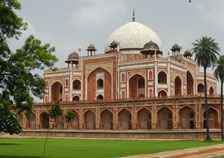 The famous Humayun's Tomb of Delhi is the final resting place of Mughal Emperor Humayun, which was commissioned by his first wife in 1569. It is the first garden tomb in the Indian subcontinent and also the first building to use red sandstone so extravagantly. Located on the banks of the River Yamuna, the tomb received its status as a UNESCO World Heritage site in 1993. The most prominent Sikh gurdwara, the Bangla Sahib Gurdwara is located near the main Connaught Place in Delhi and is instantly recognizable by its stunning golden dome and tall flagpole. 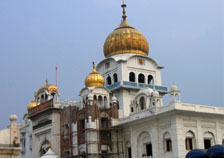 The gurdwara houses a temple, a holy pond, a school and an art gallery within its compound.